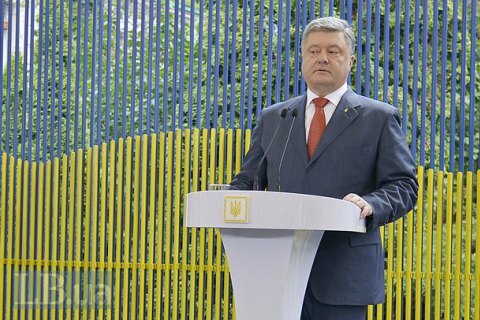 Poroshenko: vote for the "special status" of Donbas will be held after the withdrawal of Russian troops. President Petro Poroshenko says the Verkhovna Rada will vote for changes to the Constitution in terms of decentralization only after the withdrawal of Russian troops from Donbas. "In order to ensure the adoption of [changes to] the constitution, several conditions must be met: Firstly, it is a cease-fire," Poroshenko said in an interview with the French TV channel Іtele on 21 June. "Secondly, it is the withdrawal of Russian troops from the Ukrainian territory. Thirdly, the uncontrolled section of the Ukrainian-Russian border, the line of contact and places of deployment of heavy weapons should be placed under the control of OSCE's monitoring teams." "And one more thing - fair elections should be held first, which the Russian side prevents from holding," Poroshenko added. The draft amendments to the Constitution on the decentralization and the peculiarities of the local government in some regions of Donetsk and Lugansk regions was adopted in the first reading on 31 August 2015. The draft bill provides that "the peculiarities of local self-government in certain areas of the Donetsk and Luhansk regions shall be regulated by a separate law." This temporary law was passed in October 2014 and will come into force only after local elections by Ukrainian legislation are held in Donbas. If this does not happen within the next two years, the law will lose force.